For boats greater than 6m LWL and less than 10m LWL Coxshall Marine Electronics & Surveying recommend the Sonic Shield II. This is a two transducer solution and can use shore power and a DC power source. If shore power is not available then we would recommend the Sonic Shield II Micro. This is a two transducer solution but cannot be plugged into shore power. 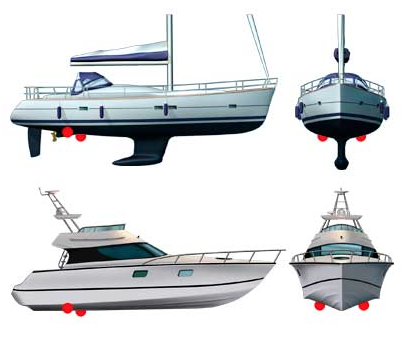 With an ultrasonic antifouling system by Coxshall Marine Electronics & Surveying installed to your boat you will have a more efficient hull leading to lower fuel costs. The annual haul and antifoul will be a thing of the past. The system is easy to install and requires no holes to be drilled in the boat, everything required to install the system is included within the shipment. The self explanatory manual will have your system up and running in a couple of hours. No electrical experience is required as the entire system is supplied with Plug and Play 100% waterproof connectors. A 2 Year warranty and our Try for £75 offer provides complete piece of mind. Designed and Manufactured in the UK by an electronic development company with over 32 years experience. SonicShield protection for your boat will eliminate the need to antifoul annually by the scientific process of destroying algae at cellular level. Removing the algae destroys the food for all larger aquatic lifeforms such as Barnacles and Mussels. The system is 100% safe to humans. Operating worldwide in over 60 countries the Ultrasonic protection can prevent the need to scrub your hull mid season to ensure your optimum cruising speed is maintained. Coxshall Marine Electronics & Surveying can install the system to your boat for you if you wish - please contact us to arrange planning and installation. To view our short notes on installation considerations please click here.